Global fixed income trading revenue has fallen faster than headcount over the past four years, according to Coalition. 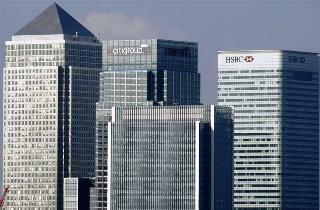 Pressure is growing on banks, especially in Europe, to cut costs. Technology will replace more humans on the dealing floors. Buildings are seen in the Canary Wharf business district in east London. The world’s 12 biggest investment banks by revenue reported a combined top line of $86.5 billion in the first six months of 2018, data provider Coalition said on Sept. 6. That was up 6 percent from the same period a year earlier and driven by an increase of 20 percent in equities trading. Revenue from fixed income, currencies and commodities (FICC) trading was unchanged at $38.5 billion, with the foreign exchange and commodities business offsetting weakness in credit and interest rates.